Take time out from San Francisco on a half-day trip to Muir Woods and Sausalito. This enthralling half-day trip takes you across the Golden Gate Bridge to the Bay Area's most popular national monument and the prettiest village in California where you can choose to take the Sausalito ferry back to San Francisco. After crossing the impressive Golden Gate Bridge, you'll stop for a view of San Francisco from Vista Point before driving through the coastal mountains to Muir Woods (admission included). This national monument is the site of a virgin forest of California Coast redwood trees, among the oldest and tallest on earth. 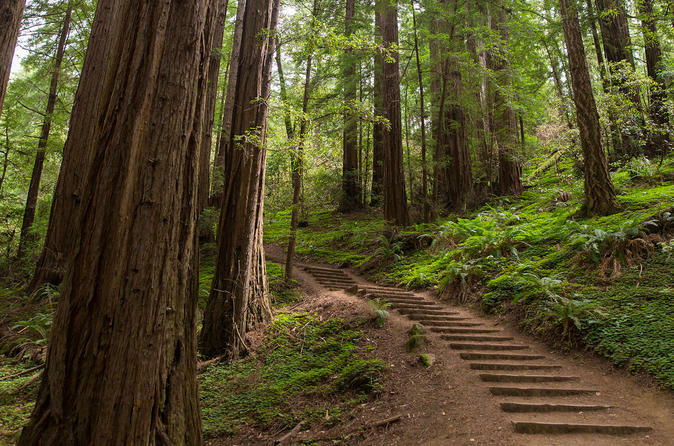 Take the opportunity to roam through an ancient forest of giant redwood trees on your 75-minute visit of Muir Woods. This morning or afternoon tour also takes you to Sausalito, a quaint Mediterranean-style seaside village. Stroll along the waterfront, shop or take photos in this picturesque artists' colony nestled on the northern shores of San Francisco Bay. From Sausalito you can choose between being dropped off at Union Square in San Francisco or taking the Sausalito ferry back to San Francisco. Special Offer - Book by November 11, 2018 to save 10% off our previously offered price for theÂ Morning, Mid-Morning and Afternoon tour options. - Book Now!